Introducing our new IntelliCut CNC plasma gantry kits. Designed for cutting large steel plates our cnc plasma gantry kits combine heavy duty contruction and precision machining. With the ability to combine multiple plasma and flame cutting torches, IntelliCut has the solution for you. Fast, accurate, powerful and smart. 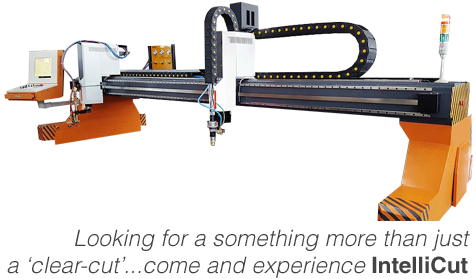 If you need to cut large steel plates then you need a CNC plasma gantry machine. IntelliCut has many different options, depending on your requirement MTO will assist you in finding the best gantry cutting solution from start to finish. . Cutting Mode: Plasma / Flame. Drive Mode: AC Servo motor, Dual-Drive. Driving Motor: Panasonic / YASKAWA. CNC Controller: Hypertherm EDGE CONNECT TC; EDGE CONNECT; LKNC-3200. Software: Fastcam, SmartNest, Hypertherm, SigmaNest. 1.) You want to go fast? And save money? Buy a plasma cutting table.